Our mobile locksmiths conveniently come to you to provide all of our locksmithing services including key cutting. Gone are the days where you have to take your keys or locks to a locksmiths workshop to get new keys cut. With our mobile locksmith service we bring the workshop to you. Our locksmiths vans are stocked with the latest locksmith equipment and large range of blank keys for key cutting. Once on site our expert locksmiths can cut any key in minutes at your location. We even provide electronic keys for cars. 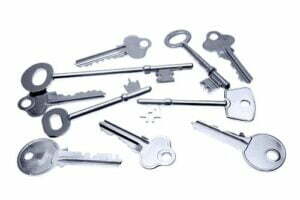 We can cut keys for all sorts of locks including: door locks, deadlocks, dead bolts, window locks, garage locks, fence locks, padlocks, cars, skeleton key locks, bedroom, bathroom, letterbox and security locks. We can copy any key, however if it is a restricted access key or security key we will need proper authorisation. If you are unsure simply give us a call and we can advise you. If you have a key that you want to make a copy of simply hand it to our mobile locksmith and they can cut a new key for you on the spot. When using this method it is best if you can provide us with an original key that came with the lock as opposed a previously copied key. However if you only have a copy it should be fine. Either way our mobile locksmith will ensure that the new key fits the lock and operates correctly before they leave. If you do not have access to any keys then we can cut a new key by using the lock itself. This technique works on most locks and is effective as it does not affect the use of the lock at all. It is a great option if you have lost a key and do not want to invest in rekeying the lock itself or installing new locks.